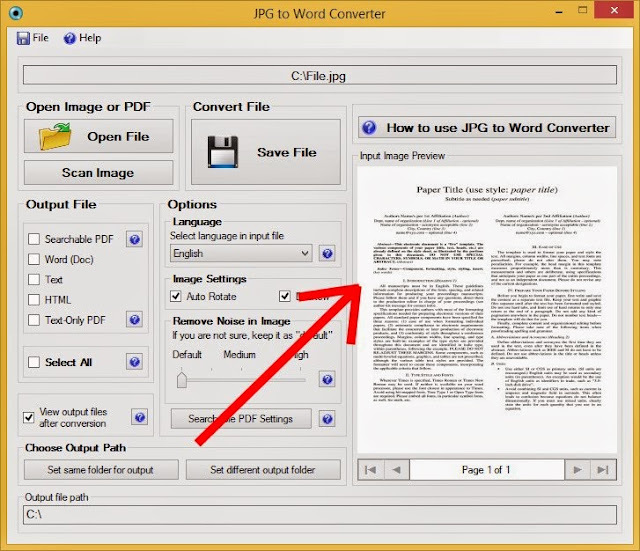 How to use OCR Software to convert Images to Text. Technology is advancing day by day. Long gone are the days when you had to type out all the content of an image file just to edit it. 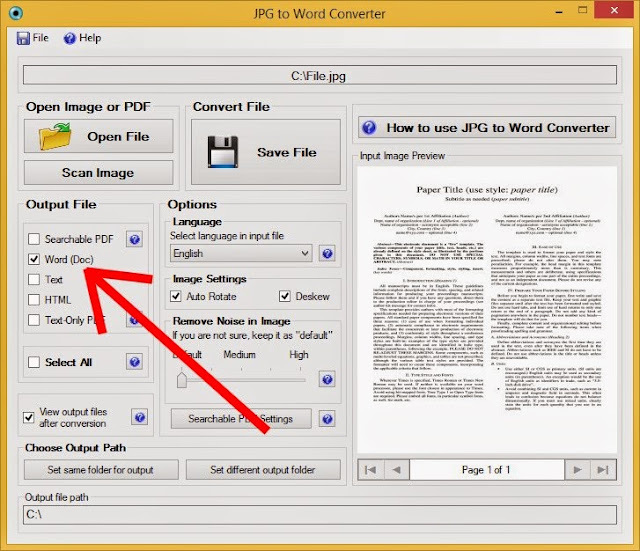 Today, you can just convert the JPG File directly to a Word File by using OCR tools. How are the files converted? The technology that JPG to Word converters use is called OCR or Optical Character Recognition technology. This technology has been around for sometime and is used by both online tools and OCR software. This technology relies on scanning the individual characters and comparing them against the stored characters. Once a match is found, it moves on to the next character. There are two techniques to accomplish character recognition. One technique, as mentioned above, scans each individual character and compares it against a stored character. Of a match is found, it proceeds to the next character. The major drawback of this technique is that if two characters are similar in appearance then the output is distorted. Another technique to convert the files is to use feature recognition. Feature recognition utilizes the fact that each letter of the alphabet has a different feature or strokes that make up the character. The OCR tool compares the features of the input character with that of the stored features. This eliminates the possibility of getting same output character for two different character since each character has a different feature. This technique improves the accuracy and is therefore widely used. How to convert JPG Files to Image Files? The actual conversion is really easy. We just need to use the software that harness the OCR Technology. We can either use online tools to convert the image file or use a downloaded OCR software. The major flaw with online tools is that an internet connection is always required to utilize the tool. This problem is solved by using downloaded OCR software which can work offline. Another advantage of using downloaded OCR software is that it needs to be downloaded only once. There are a lot of OCR software out there to choose from. All of them are equally good. 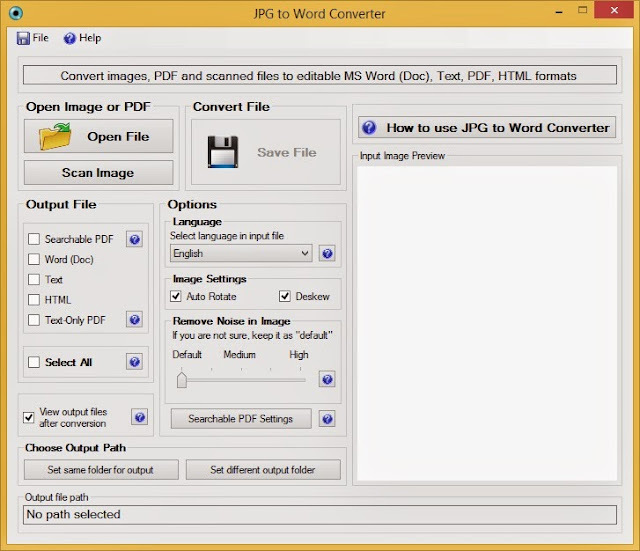 For the benefit of the user, we have focused here only on one software, namely, JPG to Word Converter. 2. After the download is complete, install the software by following the on-screen instructions. 5. After uploading the input file, we have to select the output format of the file. We need a word document as the output so we check Word on the list. The image below clarifies this point. Viola! You just converted a JPG File to a Word File. You can refer the video below for further reference. Note that the program uses OCR technology. This technology relies heavily on reading the features of the characters in the input file. So care must be taken that the input file is of a high quality. If the input image is a low quality image then the output will not represent the input file completely. Also, it should be noted that the software can be used to save the output in all the available formats. To do so, manually check the individual formats or check the select all box. Additional help is provided in the software itself. Just click on the help icon beside the part you need help for. Or else click on “How to use JPG to Word Converter” on the right side of the screen. You can also use additional security features of the software to put a watermark on the output files. Password protection is also present for output files so that only you can access them. There you go! You just converted a JPG file into a Word file.